Dave Walder is about to set foot on the road less travelled. 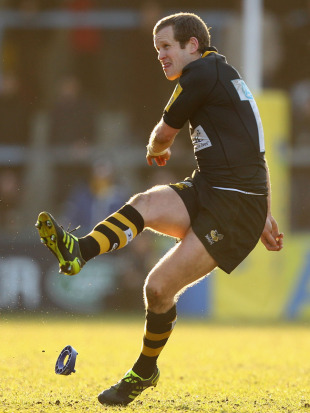 The diminutive fly-half, a Wasps player until the end of the season, is close to agreeing a move to Japan with Tokyo-based Mitsubishi, where he hopes to enjoy two more years of action while also furthering his coaching education. As one of the league's most reliable practitioners, Walder has become part of the furniture in the Premiership. After a successful spell with Newcastle and glitzy introduction to Wasps in 2006, where Premiership titles and Heineken Cups were the order of the day, the 32-year-old now has one eye on life further down the road and a career marshalling the champions of the future. First, he will make an assault on one of rugby's remaining frontiers. The Japanese top flight has grown in stature in recent seasons through exposure to the likes of Wallabies legend George Gregan and former All Black Tony Brown, while Springboks scrum-half Fourie du Preez will make the switch post-World Cup. Big-money moves to Japan are commonplace for players plying their trade in New Zealand or Australia, but it is far less common for a northern hemisphere player to trade in. For Walder, Wasps' reluctance to offer him a two-year extension opened the door to experience something completely new. "I've always wanted to make a lifestyle decision at the end of my career and try something new," he said. "Originally the plan was to go to France, sort of five or six years ago I was hoping I'd finish my career in France, but then the Japanese thing came along. "I don't think the French market was quite as exciting or quite as appealing as it maybe was three or four years ago, with French clubs having had their fingers burned a little bit with some players and some players having had their fingers burned with French clubs. "I didn't want to leave Wasps but I was at the stage where I said I wanted to do two more years and that would probably be me, and Wasps only offered me a one-year deal. The Japanese club came along and offered me a two-year deal, I bit their hand off really. It ticks all the boxes: a major city in the world, learning a new language, financially better off, the season is shorter. It's a chance to experience a new way of life and hopefully I can bring a few aspects of the English game to the Japanese." A big part of the challenge for Walder is the opportunity to add to his coaching resume. This season he has been complementing his playing duties with Wasps with time spent learning the coaching ropes at National One side Rosslyn Park and his move to Japan could represent stage two of his plan. "I've been asked to work with the backs coach over there," he said. "Rosslyn Park have been great to me, I've really enjoyed that. They've given me a taste for it. I'm not ready to hang the boots up yet but I'd be looking to do so after a couple of seasons. Coaching is very much something I want to go into. It's something I've always enjoyed doing. I like being outdoors, I like being able to watch people develop. "I have to make sure it's the right thing, with all due respect I don't think anything below National One would appeal to me too much, that's where I've set my sights and I'd like to go higher, Championship, Premiership and beyond. Rosslyn Park have given me a grounding and given me an entry into it, I've learned a few good things this year that will hold me in good stead moving forward." The second annual St George's Day Game between London Wasps and Bath Rugby will be staged at Twickenham on April 23. Four special causes will be celebrated, with Wasps donating £1 for every ticket sold to the charities. BLESMA (Limbless Veterans), the Parachute Regiment Charity, Combat Stress and SBSA (Special Boat Service Association) will all be involved. Tickets are on sale now by calling 0844 225 2990 or from ticketmaster.co.uk and are priced from just £15 for adults and £8 for concessions.